You may donate to the project using the Dreamcatcher 2nd Anniversary Projects paypal pool (donations can be made anonymously as well) or use the paypal.me link and mention "DC 2nd anniversary project" if your country does not support paypal money pools. Be aware that in order to get the rewards, 7D has to receive the correct amount (over $20, $30 or $50 for the tiers) so please donate using Personal Payment/Friends and Family method. If you are paying using other transaction types, please add 4.5% to the amount that you are donating to cover the transaction fees. Also note that the paypal is under the name of one of our admins to avoid restrictions being placed on our account. 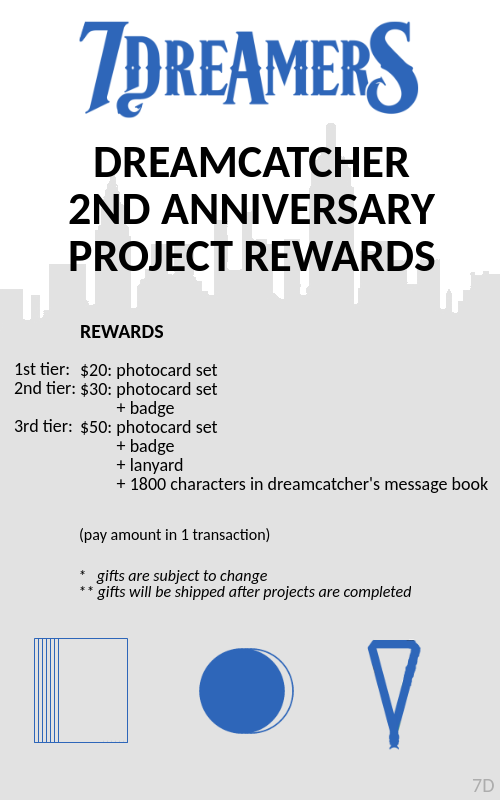 To claim your rewards (for donations $20, $30, $50 and over) please fill in this DREAMCATCHER 2nd Anniversary Donation Rewards google form. This also includes the 1800 characters message in the message book for donations $50 and over. 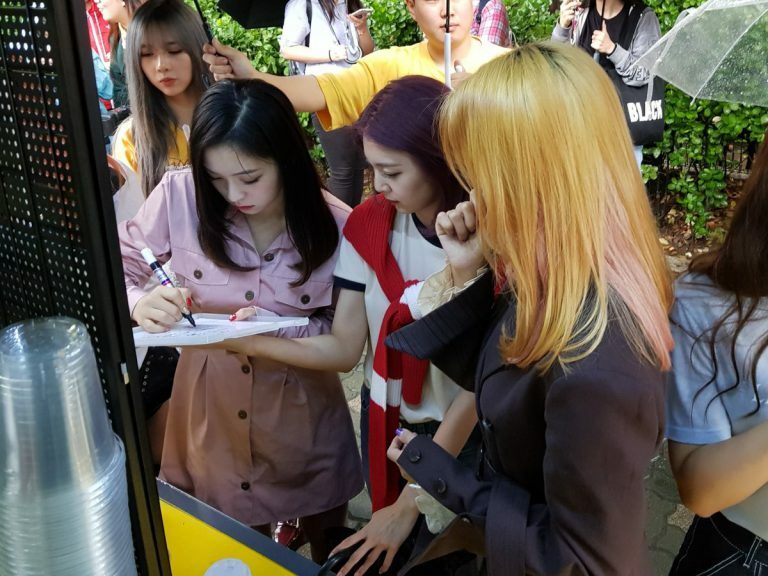 To write a free message (300 characters max) to dreamcatcher for the message book, please fill in this Dreamcatcher 2nd Anniversary Message Book google form. Please make sure to check that your message is not more than 300 characters (not words). If your message is longer we cannot include it in the message book. 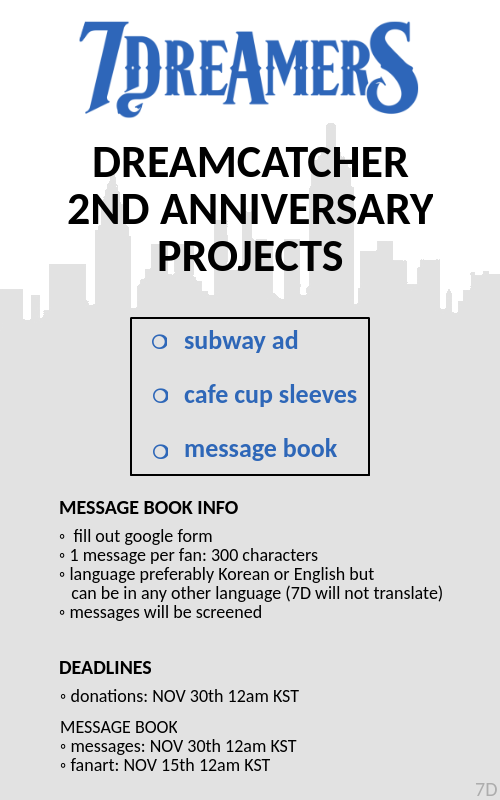 If you want your fanart to be included in the message book, please also fill out the Dreamcatcher 2nd Anniversary Message Book google form and email your fanart in HD (scan) to seven7dreamers@gmail.com. 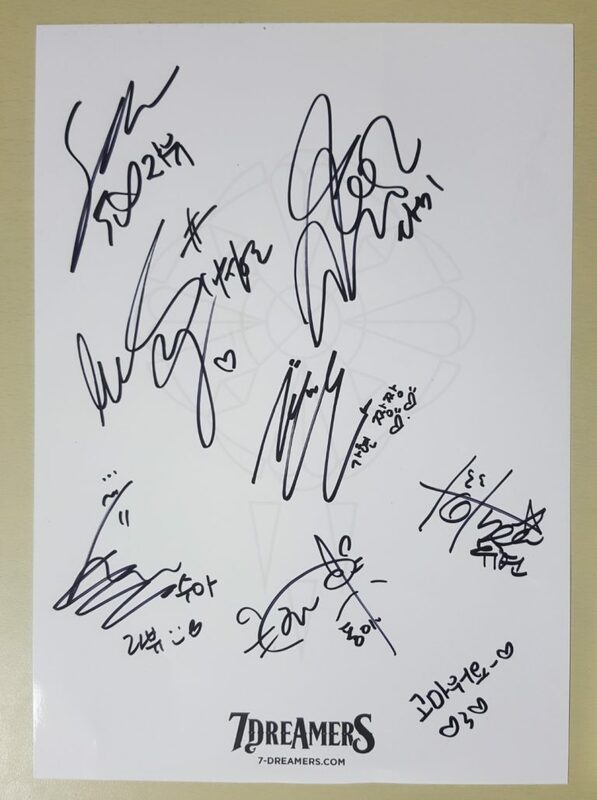 As a special thank you to the fan that donates the most funds to our 2nd anniversary project, 7DREAMERS will gift them the paper that dreamcatcher signed during our foodtruck support! We will publish a weekly leaderboard on our homepage.